We're used to snow in our area, but our front yard shows that it's been especially snowy this year. We have a reindeer and sleigh Christmas decoration that's staked into the ground. By this time of the year, we've usually had a thaw that gives us a chance to get the stakes out of the ground and put the decorations away. Not this year. The reindeer and sleigh sit in a lot of snow and we're contemplating whether we'll have to hang shamrocks from the reindeer's antlers or put Easter eggs in the sleigh. 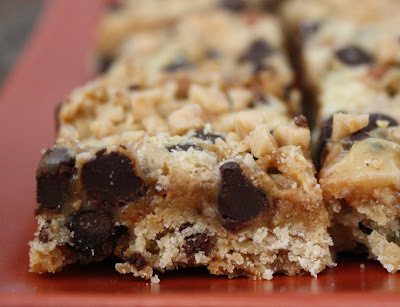 When it's cold and snowy, one of my favorite things to do is bake, and this recipe for Rich Chocolate Chip Toffee Bars is one of my favorite new recipes. 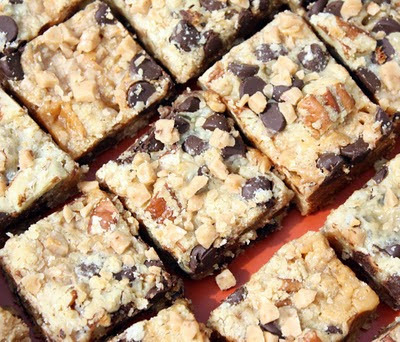 It comes together quickly -- just a little bit fussier than Magic Cookie Bars, because the shortbread crust bakes for a bit before you add the toppings and sweetened condensed milk. Because the toffee bits and sweetened condensed milk are very sweet, I like making them with a dark chocolate chips to offset the sweetness. They are sure to remain on my repertoire long after the reindeer and sleigh are hibernating in the rafters of our garage. Combine flour and brown sugar in large bowl. Cut in butter until mixture resembles coarse crumbs. Add egg; mix well. Stir in 1-1/2 cups chocolate chips and nuts; set aside 1-1/2 cups mixture. Press remaining crumb mixture onto bottom of prepared pan. Bake 10 minutes. Pour sweetened condensed milk evenly over hot crust; set aside 1/4 cup toffee bits. Sprinkle remaining toffee bits over sweetened condensed milk. Sprinkle reserved crumb mixture and remaining 1/2 cup chips over top. Bake 25 to 30 minutes or until golden brown. Top with reserved toffee bits. Cool completely in pan on wire rack. Cut into bars. About 48 bars.